Book now and enjoy your pass! The Guided Tour is aimed at all public who can go down 54 comfortable steps and 86 up… The paths are always wide and their coating is non-slip. Light and sound environments evolve throughout the visit, supporting the comments of your guide. 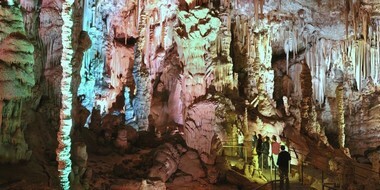 The Grotte de la Salamandre, because of its surprising dimensions, can be accessed by those who normally fear confined places and even the tallest are unlikely to head banging. Continuous handrails provide support for the whole duration of the visit, from the entrance to the exit. Several kilometres of optical fibre were set to mark the edges of paths and steps by small bright dots. Save time : book your pass now (not mandatory, but recommended in season). Check our availability and book online with secure payment. Come at the selected time and go directly to the entrance. Show your ticket printed or displayed on your smartphone screen to the guide.